Simple, effective way to cleanse hair and remove product build-up. 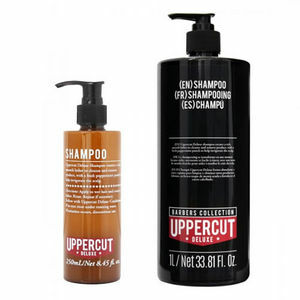 Uppercut Deluxe Shampoo is designed to cleanse, moisturise and reduce oiliness so that your styling products have some great hair to work with. The shampoo contains an anti-irritant complex of liquorice and camomile and also panthenol to help moisturise and reduce oiliness. There's also peppermint extract to provide an energising boost and a great smell, as well as nourishing your scalp. Available in a 250-ml retail size or a barber-shop-friendly 1000-ml bottle. £3.72 (inc. VAT) Why no VAT? We're a trade wholesaler and quote our prices without VAT to help our VAT-registered customers understand the true cost of a purchase. Peppermint-packing, restorative conditioner that leaves hair more manageable and easier to work.